Part 1 of this article recommended that the U.S. Environmental Protection Agency (EPA) be reorganized into a five-person commission. The primary reason is to dilute the massive regulatory powers that currently reside in a single administrator, whose agency in recent years has been responsible for fully 25% of all federal regulations, a number of which were sharply criticized as being based on faulty or insufficient evidence. Secondly, a five-person commission would make it more difficult for the agency to manipulate science, economics and facts in the rulemaking process. The minority members of the commission would have access to the same data as available to majority commissioners, thus allowing for minority reports that would be used in the rulemaking process and by courts in judicial reviews of a regulation. This second installment recommends a few modest but substantive changes that would create an agency better able to balance environmental protection with economic growth, and to recognize that a strong economy is also essential for human health and environmental quality. 1) Transform the agency from one in which each part of the agency focuses on a single statute, thereby fostering myopic thinking, into an agency that coordinates functions to address all the most serious environmental risks facing our country. To make this change, the agency needs to appreciate that what was needed or what worked in the 1970s and 1980s (addressing specific types of end-of-the-pipe pollution) is not as relevant today, because most of those earlier challenges have been addressed. Today the agency needs to focus on preventing new kinds of pollution, using Big Data and technology to identify and address the new risks, and addressing the most significant environmental issue of all: poverty. If EPA truly wants a better environment, it needs to reverse its policy of limiting the placement of new industries in minority and low-income areas. These areas need jobs that pay fair wages so that workers can provide food, shelter, education and healthcare for their families by working at companies that are accountable for achieving all environmental standards. 2) EPA needs to recognize that all risk is not equal. It must identify and prioritize risks, and address the most serious risks first. EPA itself first recommended this approach in 1990 in its report Reducing Risk: Setting Priorities and Strategies for Environmental Protection. This report recognized that the agency often concentrated on risks perceived by the public to be most significant – frequently because of intense media and environmentalist pressure group campaigns – notwithstanding that in many cases the science community presented a very different view of the same risks. 3) EPA must recognize that the states are partners, not servants of the Federal Government. States currently implement over 80% of EPA’s delegated programs. Yet they receive only 30% or so of the funds needed to administer these programs. Moreover, if EPA disagrees with a state on an enforcement matter, EPA thinks nothing of interfering with the state’s approach. Once EPA delegates a program to a state, the state should be completely responsible for administering the program. If EPA believes the state is not implementing the program properly, it should hold a hearing on the state’s actions. If EPA finds the state is indeed implementing the delegated program improperly, it should withdraw the entire program from state jurisdiction and implement it with federal resources. Only by fairly reviewing a state’s complete implementation of an EPA program can EPA determine the value of the state’s activity. 4) To reduce regulatory churn and overreach, Congress should mandate that, once a regulation is issued, EPA should be barred from amending the regulation for ten years unless there is an emergency. That would ensure that a new administration or environmentalist pressure does not result in ever-tighter, politically inspired standards. 5) EPA currently operates as investigator, rule-writer, prosecutor and judge for all claims of environmental harm or failure to comply with regulations. This system is unfair and costly to a company defendant, since even an administrative trial judge is an EPA employee. To bring fairness to the system, a defendant should be allowed to proceed immediately to federal court, where it and EPA will be on equal footing before a federal judge. 6) Congress should establish within EPA an independent Bureau of Environmental Statistics that would undertake independent peer reviews of the economics and science used by the agency. 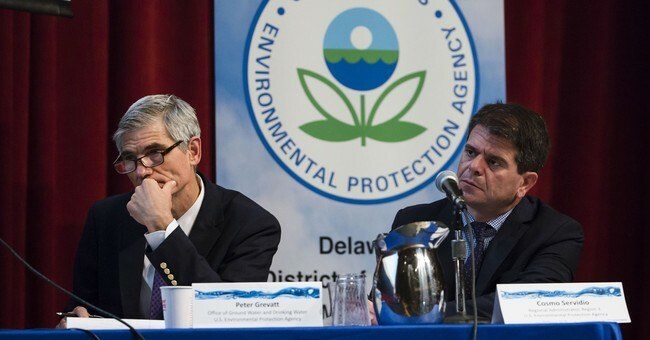 7) EPA should release all data it relies on, via a rulemaking presented for public review. There is no place for secretive, non-reviewable science in the public policy arena, especially considering the impact of costly regulations on jobs, local economies, and thus the health and welfare of American families. 8) Congress should authorize EPA to develop a performance-based regulatory system that could be implemented in lieu of the current command and control system. This will encourage business innovation and significantly reduce regulatory uncertainties and costs. 9) EPA should encourage companies to undertake routine environmental audits, as the most effective mechanism for ensuring environmental compliance. If a company discovers non-compliance, it should immediately remedy the matter. To encourage environmental audits, EPA should waive penalties for the prompt reporting and remediation of a problem. 10) EPA’s climate science work should be transferred to the Department of State, since contentious climate science, economic, energy and human welfare issues cannot be resolved by any one nation. It must be a global effort. These recommended changes will bring regulatory efficiency and improved public welfare, by eliminating several levels of government activity to implement the same programs. They will reduce regulatory overreach, while promoting compliance. They will also provide the public with transparency, to ensure a sound foundation for regulatory activity. This simple fairness and transparency is little to ask of an agency that was created to protect our overall environment, health and welfare – a policy that all Americans support.